Saturday morning June 5, 2010 (fifth travelogue of this trip). Tuesday we had a “down” day. We were pretty wiped out from the two previous days. Dan caught a nice bass (perhaps 4 pounds) in the lake that our condo adjoins. We barbecued the fish along with hamburgers and hot dogs for dinner. During the week, Dan and the kids did quite a bit of fishing. They all caught some nice bass, but they returned them to the lake. Wednesday we went to Kennedy Space Center and had a ball. Two of the grandsons are pretty technically oriented and we had a great time looking backwards into the space program that put man on the moon. They have a Saturn V rocket on display and we were blown away by how large it is. We also took in an IMAX on the moon landing. After that, we had Adam (our taxi driver) take us to Cocoa Beach. There we had a great lunch at a restaurant on the beach and then went down and spent some time in the sand an surf. On the way home we stopped at the famous Ron Jon surf shop to get some T-shirts. Thursday was Josh’s (our grandson) birthday. We spent quiet morning in the condo. In the afternoon, we arranged for Dan and the two boy to take a helicopter tour (Josh’s suggestion). It looked so fun that I scheduled a second flight with Josh and Brandon. 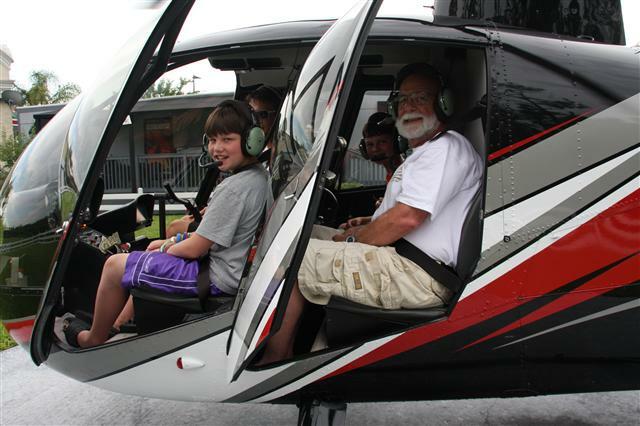 Attached is a photo of us in the helicopter. For dinner Dan cooked a special shrimp pasta dinner (Josh’s favorite). Yesterday, we again took it easy in the morning and then went shopping for souvenirs in the afternoon. We again barbecued for dinner (partly to empty the fridge). This morning we cooked a breakfast using most of the rest of the food in the fridge. Without question, this was a great trip!! We had a nice mixture of hectic touring and relaxing. This entry was posted in Uncategorized and tagged helicopter, Orlando. Bookmark the permalink.